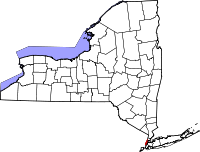 New York County, or more commonly known as the New York City borough of Manhattan, is the most densely populated county in the state, and has the third highest population behind only Brooklyn and Queens. The New York County Clerk also operates as the Clerk of the Supreme Court, and as such, is responsible for maintaining all civil and criminal court records, in addition to others such as property and probate records. The office provides the Supreme Court Records Online Library that contains a large number of court records and is free for the public to use. The County Clerk's main office is located in Room 161 within the New York County Courthouse at 60 Centre Street. New York City is served by a number of local organizations, as well, including the New York Historical Society Museum and Library and the New York Genealogical and Biographical Society.